Vega is the fifth brightest star in the sky and the second brightest star in the northern celestial hemisphere, after Arcturus. It is a relatively close star at only 25 light-years from Earth, and, together with Arcturus and Sirius, one of the most luminous stars in the Sun's neighborhood. Vega is only about a tenth of the age of the Sun, but since it is 2.1 times as massive its expected lifetime is also one tenth of that of the Sun; both stars are at present approaching the midpoint of their life expectancies. Vega has been extensively studied by astronomers, leading it to be termed "arguably the next most important star in the sky after the Sun." Vega was the northern pole star around 12,000 BC and will be so again around AD 13,727. Vega was the first star other than the Sun to be photographed and the first to have its spectrum recorded. It was one of the first stars whose distance was estimated through parallax measurements. Vega has served as the baseline for calibrating the photometric brightness scale, and was one of the stars used to define the mean values for the UBV photometric system. Epsilon Lyrae shown in the diagram above as the Double Double is a multiple star system .The widest two components of the system are easily separated when viewed through binoculars, or even with the naked eye under excellent conditions. The northern star is called ε1 and the southern one is called ε2; they both lie around 162 light years from Earth and orbit each other. When viewed at higher magnifications, both stars of the binary can be further split into binaries; that is, the system contains two binary stars orbiting each other. A number of other nearby stars may also be part of the system, bringing the system to a total of ten stars. 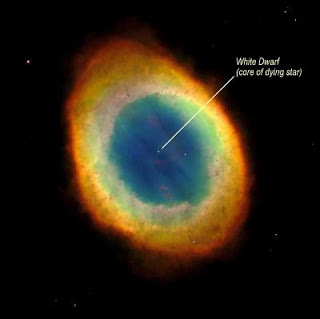 Also shown on the diagram above is the famously named "Ring Nebula" catalogued as Messier 57. It is one of the most prominent examples of a planetary nebula, the gaseous remains of red giant star that has ended its life by expelling its material into the interstellar medium. This nebula was discovered by Antoine Darquier de Pellepoix in January, 1779, who reported that it was "...as large as Jupiter and resembles a planet which is fading." Later the same month, Charles Messier independently found the same nebula while searching for comets. It was then entered into his catalogue as the 57th object. Messier and William Herschel also speculated that the nebula was formed by multiple faint stars that were unable to resolve with his telescope. In 1800, Count Friedrich von Hahn discovered the faint central star in the heart of the nebula. In 1864, William Huggins examined the spectra of multiple nebulae, discovering that some of these objects, including M57, displayed the spectra of bright emission lines characteristic of fluorescing glowing gases. Huggins concluded that most planetary nebulae were not composed of unresolved stars, as had been previously suspected, but were nebulosities. A planetary nebula is an emission nebula consisting of an expanding glowing shell of ionized gas ejected during the asymptotic giant branch phase of certain types of stars late in their life. This name originated with their first discovery in the 18th century because of their similarity in appearance to giant planets when viewed through small optical telescopes, and is otherwise unrelated to the planets of the solar system. They are a relatively short-lived phenomenon, lasting a few tens of thousands of years, compared to a typical stellar lifetime of several billion years. At the end of the star's life, during the red giant phase, the outer layers of the star are expelled via pulsations and strong stellar winds. Without these opaque layers, the hot, luminous core emits ultraviolet radiation that ionizes the ejected outer layers of the star. This energized shell radiates as a planetary nebula. In recent years, Hubble Space Telescope images, (including the image above of M57) have revealed many planetary nebulae to have extremely complex and varied morphologies. About a fifth are roughly spherical, but the majorities are not spherically symmetric. The mechanisms which produce such a wide variety of shapes and features are not yet well understood, but binary central stars, stellar winds and magnetic fields may all play a role. The constellation Sagittarius is clearly visible high in the south in the early evening, but will getting lower on the western horizon as October progress’. It is one of the 12 original constellations of the zodiac, the band of constellations that lies along the ecliptic, the apparent yearly path of the sun across the sky. 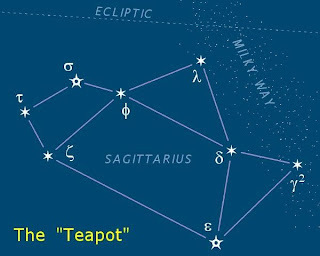 The modern asterism of the Teapot, formed from the constellation’s brightest stars, is illustrated above. 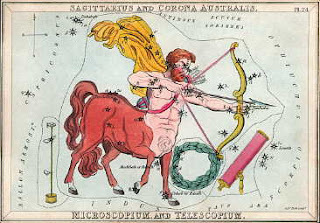 It is much easier to discern than the classical depiction of Sagittarius, below, a centaur, half man, half beast, with a raised bow and arrow. It has been visualised this way, at least since the times of the ancient Greeks. It probably originated with the Sumerian civilisation around the Euphrates, who saw the constellation as Nergal, their archer god of war. The archer is aiming his arrow at the heart of Scorpius, the bright star Antares. The Milky Way is at its densest near Sagittarius, as this is where the Galactic Center lies. The Milky Way is the galaxy that contains the Solar System. This name derives from its appearance as a dim un-resolved "milky" glowing band arching across the night sky. The term "Milky Way" is a translation of the Latin for "milky road", Via Lactea, in turn derived from the Greek kyklos galaktikos or "milky circle", "milk" also being the root for the Greek word for Galaxy, Γαλαξίας (Galaxias). The galaxy has this appearance because of the Earth's position within the galactic plane around two thirds of the way out from the center, on the inner edge of the Orion–Cygnus Arm, with the majority of the galaxy being seen edge on. The concept of this faint band of light being made up of stars was proven in 1610 when Galileo Galilei used his telescope to resolve it into individual stars. In the 1920s observations by astronomer Edwin Hubble showed that the Milky Way was just one of around 200 billion galaxies in the observable universe. The Galactic Center is the rotational center of the Milky Way galaxy, in which we live. It is located at a distance of 27,000±1,000 ly from the Earth. The complex astronomical radio source Sagittarius A, near the border of the constellations Sagittarius and Scorpius, appears to be located almost exactly at the Galactic Center and contains an intense compact radio source, Sagittarius A*, which coincides with a supermassive black hole at the center of our Galaxy. Accretion of gas onto the black hole, probably involving a disk around it, would release energy to power the radio source, itself much larger than the black hole. The latter is too small to see with present instruments. Because of interstellar dust along the line of sight, the Galactic Center cannot be studied at visible, ultraviolet or soft X-ray wavelengths. The available information about the Galactic Center comes from observations at gamma ray, hard X-ray, infrared, sub-millimetre and radio wavelengths. 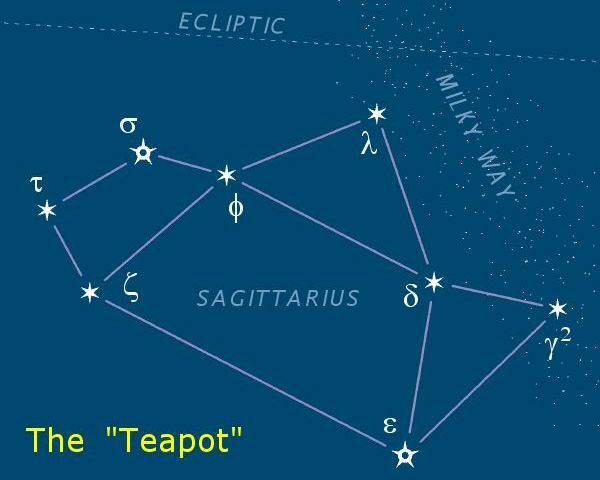 Easily visible to the naked eye, however, are the bright stars of the Teapot, which appear to be pouring tea onto the equally bright tail of the Scorpion. The illustration above shows the three day old Moon in the faint constellation of Libra. The stars forming the triangle which the moon appears to be exiting are, from the “top”, Zubeneschamali, Zubenelgenubi, a visual binary, and Brachium, an eclipsing variable. A much fainter star in the constellation of the Scales is Gliese 581, a red dwarf star with spectral type M3V, located 20.3 light years away from Earth. Its estimated mass is about a third of that of the Sun, and it is the 89th closest known star system to the Sun. Observations suggest that the star has at least four, and possibly six, planets: Gliese 581 e, b, c, g (unconfirmed), d and f (unconfirmed). Gliese 581 has been the subject of a "huge amount of attention" in the quest to discover the first habitable planet; in 2010, attention focused on unconfirmed planet g, which would have been close to the middle of the star's habitable zone, but more recently, in a study published in The Astrophysical Journal Letters, planet d "can be considered the first confirmed exoplanet that could support Earth-like life." The star system first gained attention after Gliese 581 c, the first low-mass extrasolar planet found to be near its star's habitable zone, was discovered in April 2007. It has since been shown that under known terrestrial planet climate models, Gliese 581 c is likely to have a runaway greenhouse effect, and hence is probably too hot to be habitable, analogous to Venus. A subsequently discovered planet Gliese 581 d, may be just inside or just outside the outer boundary of the habitable zone (depending in part on the greenhouse properties of its atmosphere), analogous to Mars The discovery of exoplanet Gliese 581 e the least-massive planet known around a normal star, was announced in April 2009. 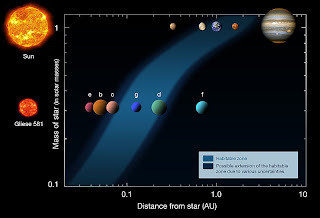 Excitement spiked again in September 2010 with the claimed discovery of Gliese 581 g, orbiting between c and d, believed to be the planet with the greatest likelihood of having conditions suitable for liquid water at its surface found to date because it is within the middle of the habitable zone. However, its existence was later put in "serious doubts" following further analysis. 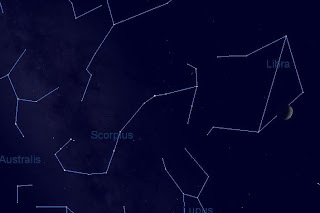 The much more distinctive, and much larger, constellation of Scorpius follows Libra in the sky. 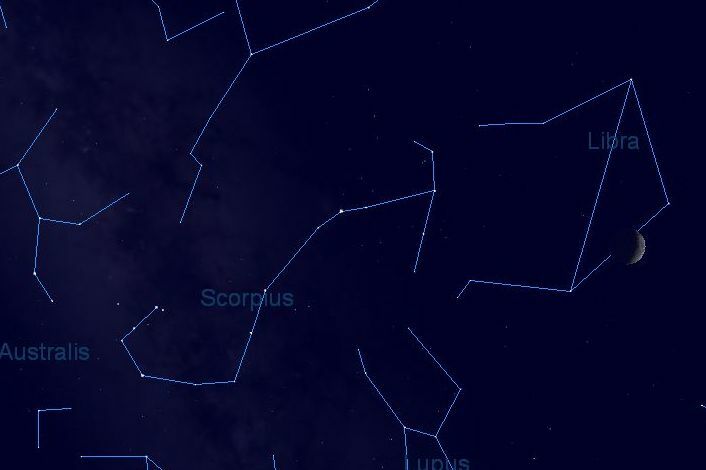 Scorpius occupies an area of 497 square degrees and contains ten stars with known planets. The brightest star in the constellation is alpha Scorpii, or Antares ("like Mars"), named for its reddish-orange colour, which resembles that of the planet Mars. Antares is a red supergiant with a radius about 800 times that of the Sun. It is classified as a variable star; its apparent magnitude varies between 0.9 and 1.8. It has a hot blue companion star about 2.9 arcseconds away. Antares is the 16th brightest star in the sky. It is approximately 600 light-years distant from Earth. It is also of the brightest stars near the ecliptic, the Sun’s apparent path in the sky. The only planets in the night sky are Saturn, which is setting at viewing time, and Jupiter which does not rise until past 10 o’clock. A meteoroid is a suggested term for a sand- to boulder-sized particle of debris in the Solar System. The visible path of a meteoroid that enters Earth's (or another body's) atmosphere is called a meteor, or colloquially a shooting star or falling star. If a meteoroid reaches the ground and survives impact, then it is called a meteorite. Many meteors appearing seconds or minutes apart are called a meteor shower. A comet is an icy, small Solar System body which, when close enough to the Sun, displays a visible coma (a thin, fuzzy, temporary atmosphere) and sometimes also a tail. These phenomena are both due to the effects of solar radiation and the solar wind upon the nucleus of the comet. Comet nuclei range from a few hundred meters to tens of kilometers across and are composed of loose collections of ice, dust, and small rocky particles. Comets have been observed since ancient times and have traditionally been considered bad omens. The probe has taken four years to get to Vesta and will spend the next year studying the huge rock before moving on to the "dwarf planet" Ceres. Asteroid Vesta looks like a punctured football, the result of a colossal collision sometime in its past that knocked off its south polar region. Vesta was discovered in 1807, the fourth asteroid to be identified in the great belt of rocky debris orbiting between Mars and Jupiter. At the time, its great scale meant it was designated as another planet but it later lost this status as researchers learnt more about the diversity of objects in the Solar System. Asteroids can tell us about the earliest days of the Solar System. These wandering rocks are often described as the rubble that was left over after the planets proper had formed. Vesta and Ceres should make for interesting subjects. They are both evolved bodies - objects that have heated up and started to separate into distinct layers. Vesta is thought to have a metal core in the centre - an iron core - and then silicate rock around it. Sometime in its history, it got banged on the bottom and a lot of material was liberated. Some of this material was pulled into the Earth's atmosphere. 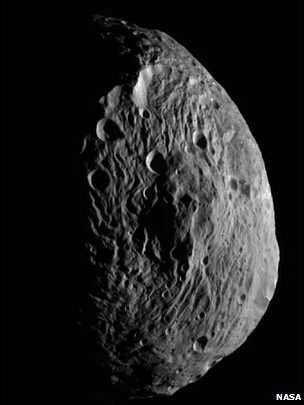 One in 20 meteorites seen to fall to Earth has been identified with Vesta. Ceres, which, at 950km in diameter, is by far the largest and most massive body in the asteroid belt, probably did not evolve as much as Vesta. 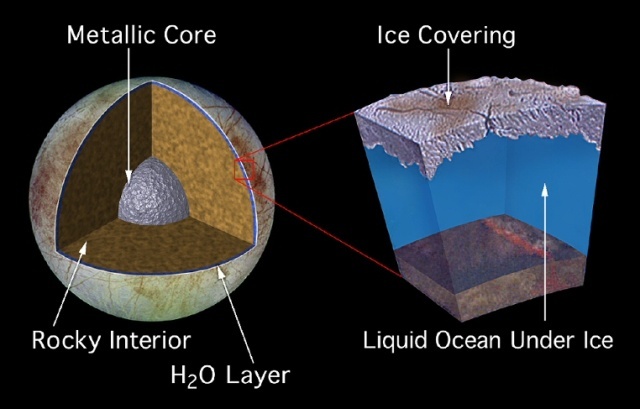 Scientists think it likely that it retains a lot of water, perhaps in a band of ice deep below the surface. Dawn's quest at Vesta over the coming months will be to map the asteroid's surface. We will not be able to observe these small, dark objects, but Saturn is still visible, as are some distinctive asterisms. 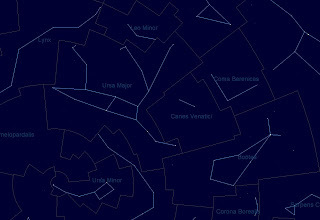 Scorpius is in the south, Ursa Major in the north, and the Summer Triangle is rising in the east. The constellation illustrated above, Virgo, is high in the south at the meeting time. 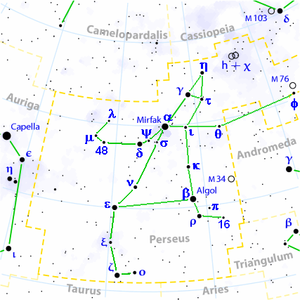 Though a large constellation, Virgo, the Virgin, does not have much of any prominent stellar pattern, relying on Spica to tell us where it is. Also shining brightly in the faint asterism is the planet Saturn, which is very close to Porrima at the moment. 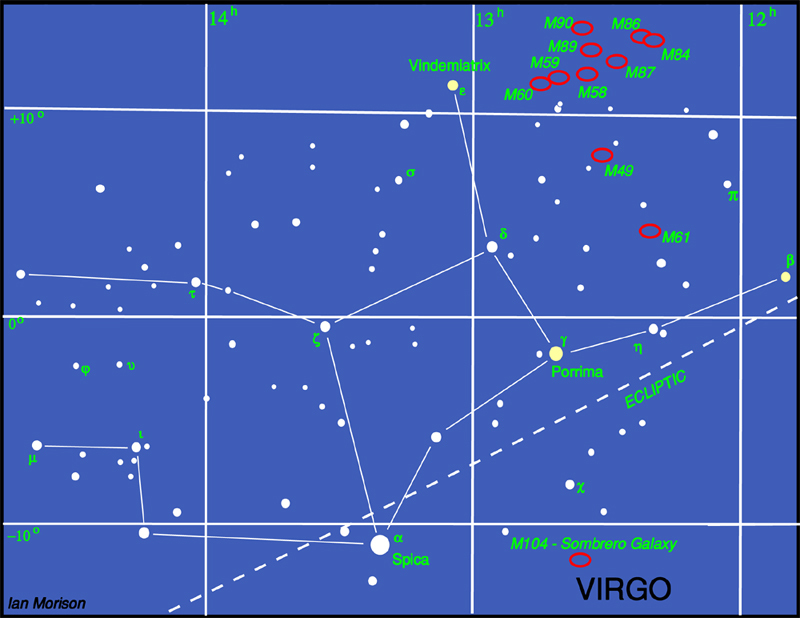 With 26 known exoplanets orbiting around 20 stars in this constellation, Virgo has more confirmed exoplanets than any other constellation. 8 planets in this constellation were discovered in 2009, which is the most planets discovered in a single constellation in a single year. The star 70 Virginis has one of the first known extrasolar planetary systems with one confirmed planet 7.5 times the mass of Jupiter. Chi Virginis has one of the most massive planets ever detected, at a mass of 11.1 times that of Jupiter. The sun-like star 61 Virginis has three planets: one is a super-Earth and two are Neptune-mass planets. 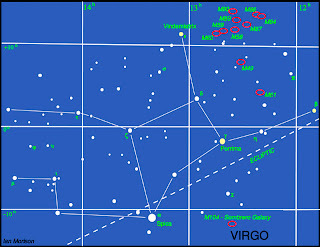 Because of the presence of a galaxy cluster (consequently called the Virgo cluster) within its borders 5° to 10° west of Vindemiatrix (which can be seen at the “top” on the cart above) this constellation is especially rich in galaxies. Though at a distance of 250 light years Spica is still first magnitude (1.04), showing its absolute brilliance, the star visually 1900 times more luminous than the Sun. The apparent brightness is deceptive, however, as Spica actually consists of two stars very close together (a mere 0.12 Astronomical Units apart) that orbit each other in slightly elliptical paths with a period of only 4.0145 four days, which makes them difficult to study individually. Both are blue class B (B1 and B4) hydrogen-fusing dwarfs (the brighter nearing the end of its stable lifetime), making Spica one of the hottest of the first magnitude stars. The high temperature produces a great deal of radiation in the ultraviolet, which renders Spica vastly brighter than visually indicated. The brighter primary star has a temperature 22,400 Kelvin, a true luminosity of 12,100 Suns, a radius 7 solar, and a mass 10.5 times solar, which may be enough to send it someday into a supernova explosion. Just up and to the right of Spica lies dimmer, third magnitude Porrima, Virgo's Gamma star (or Gamma Virginis). Unlike most star names, which are Arabic, this one is Latin and honors a Roman goddess of prophecy. A telescope shows a remarkable sight, one of the finest double stars in the sky. The components are almost perfect identical twins, both white class F (F0) dwarf stars with surface temperatures of about 7100 degrees Kelvin, significantly warmer than the Sun. They orbit each other on highly elliptical paths in only 169 years. Thirty-eight light years away, the stars average 43 Astronomical Units from each other, about the distance between the Sun and Pluto, the orbital eccentricity taking them between 81 and 5 AU. The best Saturn viewing window is nearing its end, just as the ring tilt begins to widen. Saturn moves away from Porrima, and on July 3, it will look more three dimensional as the shadows of the rings and the globe are visible. Pedro Castle, 4th June 2011, 7.30 p.m. 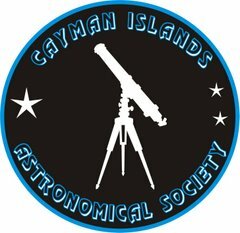 The meeting this month celebrates the 20th year of the society's existance. The constellation illustrated above is a constant source of interest to anyone who looks up and is living here, so here is a compendium of what I have found out about it trawling the web. Crux is visible from latitudes south of 25 degrees North and completely invisible in latitudes above 35 degrees North. 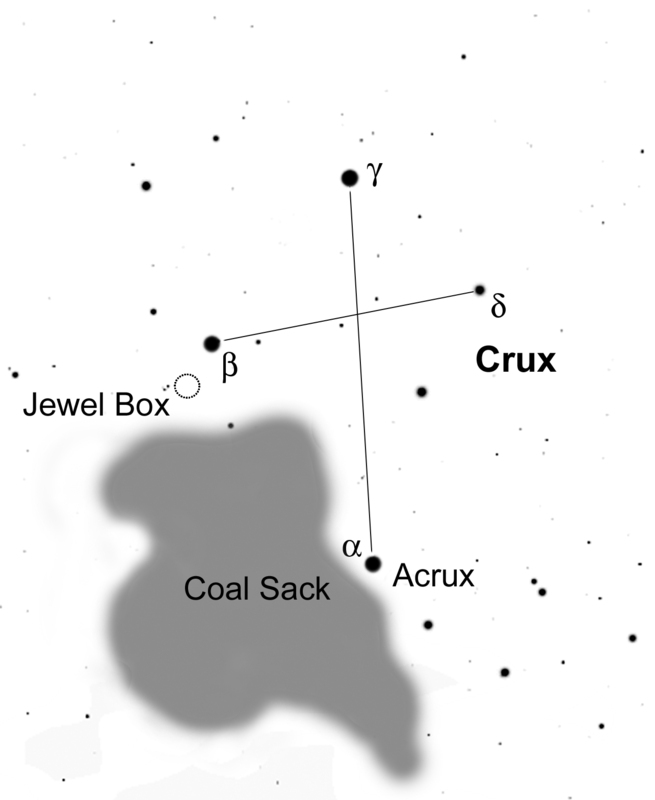 Crux, being Latin for cross, is commonly known as the Southern Cross (in contrast to the Northern Cross), and is the smallest of the 88 modern constellations, but nevertheless one of the most distinctive. It is surrounded on three sides by the constellation Centaurus. The invention of Crux is generally attributed to Royer in 1679, but we know it was written about some two centuries earlier than that. It was defined as a separate asterism in the 16th century after Amerigo Vespucci's expedition to South America in 1501. Vespucci mapped the two stars, Alpha Centauri and Beta Centauri as well as the stars of the Crux. With the lack of a significant pole star in the southern sky (Sigma Octantis is closest to the pole, but is so faint as to be useless for the purpose), two of the stars of Crux (Alpha and Gamma, Acrux and Gacrux respectively) are commonly used to mark south. Following the line defined by the two stars for approximately 4.5 times the distance between them leads to a point close to the Southern Celestial Pole. The Coalsack Dark Nebula (or simply the Coalsack) is the most prominent dark nebula in the skies, easily visible to the naked eye as a dark patch silhouetted against the southern Milky Way. A dark nebula is a type of interstellar cloud that is so dense that it obscures the light from the background emission or reflection nebula (e.g., the Horsehead Nebula) or that it blocks out background stars (e.g., the Coalsack Nebula). The extinction of the light is caused by interstellar dust grains located in the coldest, densest parts of larger molecular clouds. Clusters and large complexes of dark nebulae are associated with Giant Molecular Clouds. Isolated small dark nebulae are called Bok globules. Like other interstellar dust/material, things it obscures are only visible using radio waves in radio astronomy or infrared in infrared astronomy. The Jewel Box is an open cluster in the constellation of Crux. This famous group of young bright stars was named the Jewel Box from its description by Sir John Herschel as "a casket of variously coloured precious stones," which refers to its appearance in the telescope. An open cluster is a group of up to a few thousand stars that were formed from the same giant molecular cloud and have roughly the same age. They are loosely bound to each other by mutual gravitational attraction and become disrupted by close encounters with other clusters and clouds of gas as they orbit the galactic center resulting in a migration to the main body of the galaxy, as well as a loss of cluster members through internal close encounters. Open clusters generally survive for a few hundred million years. In contrast, the more massive globular clusters of stars exert a stronger gravitational attraction on their members, and can survive for many billions of years. Open clusters have been found only in spiral and irregular galaxies, in which active star formation is occurring. 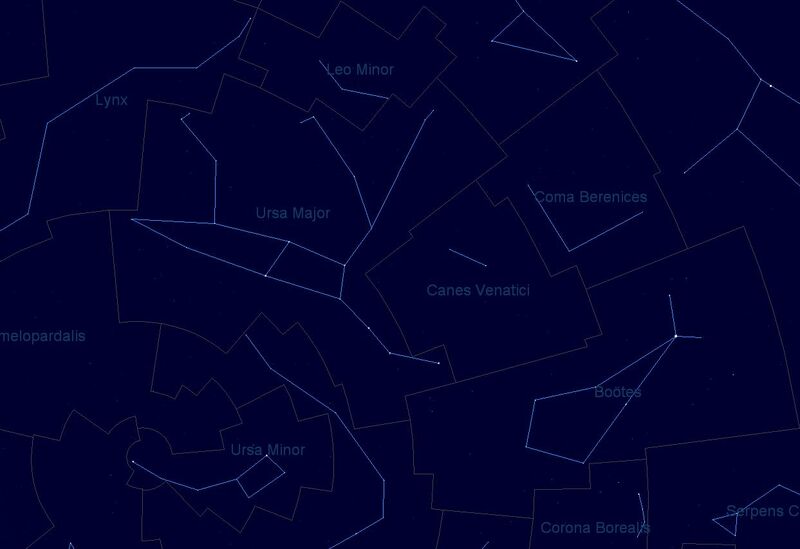 Pedro Castle, May 6th 2011 7.30 p.m.
High in the north this month lies the small constellation of Canes Venatici. The Polish astronomer Johannes Hevelius formed this constellation in 1687 from a scattering of faint stars beneath the tail of Ursa Major. Canes Venatici represents two dogs held on a lead by Boötes, snapping at the heels of the Great Bear. The southern dog contains the two brightest stars in the constellation, Alpha and Beta Canum Venaticorum. Ptolemy had listed both these stars in the Almagest as among the “unformed” stars outside the figure of the Great Bear, and hence not belonging to any particular constellation. The idea of dogs being held by Boötes was not original to Hevelius. On a star chart published in 1533 the German astronomer Peter Apian showed Boötes with two dogs at his heels and holding their leash in his right hand. On another chart published by Apian three years later the number of dogs had grown to three and the leash had moved to the left hand, but the dogs were still following Boötes and not the bear. In neither case was any attempt made to connect the dogs with charted stars, nor were they named, so the credit for showing the dogs in their current position and for making them a separate constellation remains with Hevelius. The Alpha star is known as Cor Caroli, meaning Charles’s Heart, in honour of King Charles I of England. It was given this title by Sir Charles Scarborough, physician to King Charles II. Scarborough said that the star shone particularly brightly on the night of 1660 May 29, when King Charles II returned to London at the Restoration of the Monarchy. Because of this there has been much confusion over which King Charles the star is supposed to commemorate, but it definitely refers to the first King Charles. It was originally shown in 1673 on a star map by the English cartographer Francis Lamb under the name Cor Caroli Regis Martyris, a reference to the fact that King Charles I was beheaded. Lamb and others, such as the Englishman Edward Sherburne in 1675, drew a heart around the star surmounted by a crown, turning it into a mini-constellation. The Beta star is called Chara, from the Greek for ‘joy’, the name given by Hevelius to the southern dog. The northern dog, called Asterion (‘little star’), is marked only by a scattering of faint stars. Johann Bode drew the dogs with their names engraved on their collars in his Uranographia atlas. Canes Venatici contains a globular cluster of stars, M3, and a beautiful spiral galaxy, M51, called the Whirlpool. M51 was the first galaxy in which spiral form was noticed, by the Irish astronomer Lord Rosse in 1845. It consists of a large galaxy in near-collision with a smaller one. Pedro Castle, 6th April 2011,7.00 p.m. The Trapezium, or Orion Trapezium Cluster is a tight open cluster of stars in the heart of the Orion Nebula, in the constellation of Orion. It was discovered by Galileo Galilei. On February 4, 1617 he sketched three of the stars (A, C, D), but missed the surrounding nebulosity. The fourth component (B) was identified by several observers in 1673, and several more components were discovered later, for a total of eight by 1888. Subsequently several of the stars were determined to be binaries. Telescopes of amateur astronomers from about 5 inch aperture can resolve six stars under good seeing conditions. The Trapezium is a relatively young cluster that has formed directly out of the parent nebula. The five brightest stars are on the order of 15-30 solar masses in size. They are within a diameter of 1.5 light-years of each other and are responsible for much of the illumination of the surrounding nebula. 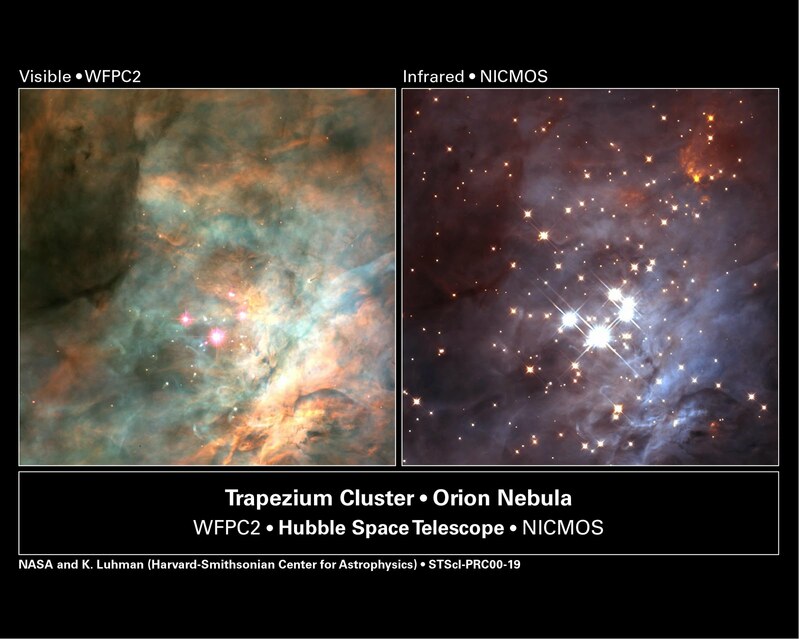 The Trapezium may be a sub-component of the larger Orion Nebula Cluster, a grouping of about 2,000 stars within a diameter of 20 light-years. The Orion Nebula (also known as Messier 42, M42, or NGC 1976) is a diffuse nebula situated south of Orion's Belt. It is one of the brightest nebulae, and is visible to the naked eye in the night sky. M42 is located at a distance of 1,344 ± 20 light years and is the closest region of massive star formation to Earth. The M42 nebula is estimated to be 24 light years across. Older texts frequently referred to the Orion Nebula as the Great Nebula in Orion or the Great Orion Nebula. The Orion Nebula is one of the most scrutinized and photographed objects in the night sky, and is among the most intensely studied celestial features. The nebula has revealed much about the process of how stars and planetary systems are formed from collapsing clouds of gas and dust. Astronomers have directly observed protoplanetary disks, brown dwarfs, intense and turbulent motions of the gas, and the photo-ionizing effects of massive nearby stars in the nebula. There are also supersonic "bullets" of gas piercing the dense hydrogen clouds of the Orion Nebula. Each bullet is ten times the diameter of Pluto's orbit and tipped with iron atoms glowing bright blue. They were probably formed one thousand years ago from an unknown violent event. The Messier objects are a set of astronomical objects first listed by French astronomer Charles Messier in 1771. The original motivation of the catalogue was that Messier was a comet hunter, and was frustrated by objects which resembled but were not comets. He therefore compiled a list of these objects, in collaboration with his assistant Pierre Méchain. The illustration above neatly fits what can be seen looking toward the south on observation night. The Winter Hexagon or Winter Circle/Oval is an asterism appearing to be in the form of a hexagon with vertices at Rigel, Aldebaran, Capella, Pollux/Castor, Procyon, and Sirius. It is mostly upon the Northern Hemisphere's celestial sphere. On most locations on Earth (except the South Island of New Zealand and the south of Chile and Argentina and further south) this asterism is prominently in the sky from approximately December to March. In the tropics and southern hemisphere this (then called "summer hexagon") can be extended with the bright star Canopus in the south. 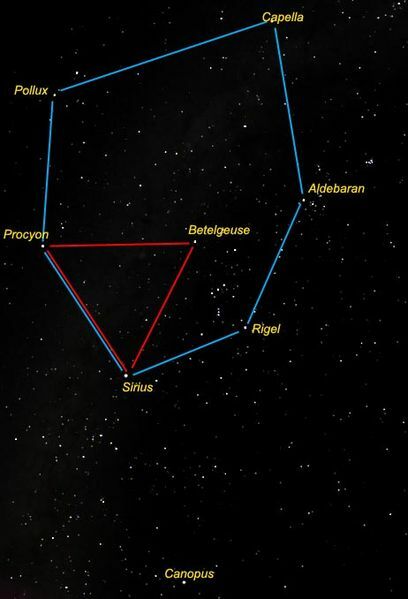 Smaller and more regularly shaped is the Winter Triangle (also known as the Great Southern Triangle), an approximately equilateral triangle that shares two vertices (Sirius and Procyon) with the larger asterism. The third vertex is Betelgeuse. These three stars are three of the ten brightest objects, as viewed from Earth, outside the Solar System. Betelgeuse is also particularly easy to locate, being a shoulder of Orion, which assists stargazers in finding the triangle. Once the triangle is located, the larger hexagon may then be found. Several of the stars in the hexagon may also be found independently of one another by following various lines traced through various stars in Orion. The stars in the hexagon are parts of six constellations. Counter-clockwise around the hexagon, starting with Rigel, these are Orion, Taurus, Auriga, Gemini, Canis Minor, and Canis Major. Canopus , which our latitude fortunately enables us to see, is the brightest star in the southern constellation of Carina, and the second brightest star in the night-time sky, after Sirius. Since Canopus is so far south in the sky, it never rises in mid- or far-northern latitudes; in theory the northern limit of visibility is latitude 37°18' north. This is just south of Athens and San Francisco, and very close to Seville. It is almost exactly the latitude of Lick Observatory on Mt. Hamilton, California, from which it is readily visible due to the effects of elevation and atmospheric refraction, which add another degree to its apparent altitude. Before the launching of the Hipparcos satellite telescope, distance estimates for the star varied widely, from 96 light years to 1200 light years. Had the latter distance been correct, Canopus would have been one of the most luminous stars in our galaxy. Hipparcos established Canopus as lying 310 light years from our solar system. Canopus is 13,600 times more luminous than the Sun and the most intrinsically bright star within approximately 700 light years. In fact, from 1 astronomical unit, Canopus would have an apparent magnitude of -37. For most stars in the local stellar neighborhood, Canopus would appear to be one of the brightest stars in the sky. Canopus appears less bright than Sirius in our sky only because Sirius is much closer to the Earth (8.6 light years). To anyone living in the northern hemisphere, but far enough south to see the star, it served as a southern pole star. This lasted only until magnetic compasses became common. In modern times, Canopus serves another navigational use. Canopus' brightness and location well off the ecliptic makes it popular for space navigation. Many spacecraft carry a special camera known as a "Canopus Star Tracker" plus a sun sensor for altitude determination. To the right of the illustration (the west) Jupiter is setting low on the horizon. On March 12th through 16th, Mercury is close to Jupiter, just after sunset, and the smaller planet’s proximity to the giant makes it easy to find. Find a clear view to the west to observe this. Seven Mile beach would be ideal. 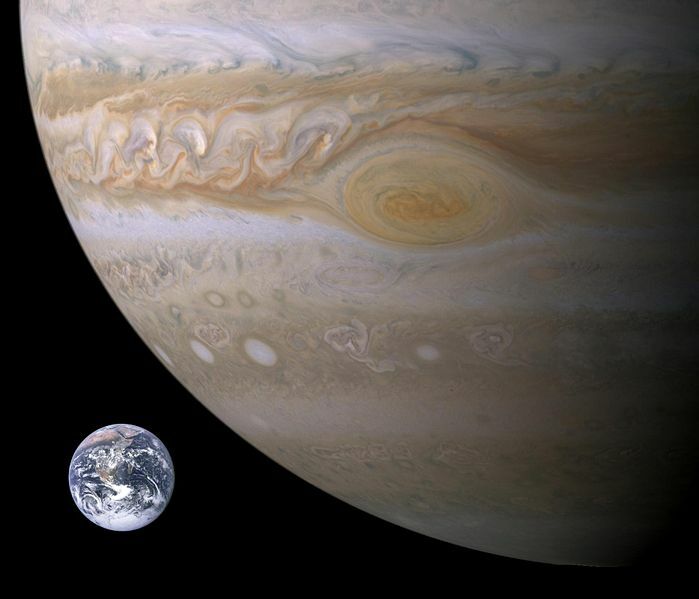 Jupiter is the fifth planet from the Sun and the largest planet within the Solar System. It is a gas giant with a mass slightly less than one-thousandth of the Sun but is two and a half times the mass of all the other planets in our Solar System combined. Jupiter is classified as a gas giant along with Saturn, Uranus and Neptune. 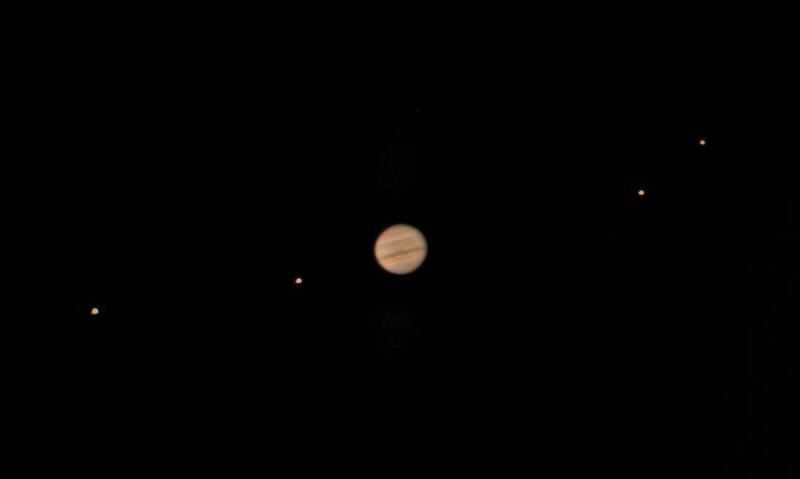 Together, these four planets are sometimes referred to as the Jovian planets. Jupiter is primarily composed of hydrogen with a quarter of its mass being helium; it may also have a rocky core of heavier elements. Because of its rapid rotation, Jupiter's shape is that of an oblate spheroid (it possesses a slight but noticeable bulge around the equator). The outer atmosphere is visibly segregated into several bands at different latitudes, resulting in turbulence and storms along their interacting boundaries. A prominent result is the Great Red Spot, a giant storm that is known to have existed since at least the 17th century when it was first seen by telescope. Surrounding the planet is a faint planetary ring system and a powerful magnetosphere. There are also at least 63 moons, including the four large moons called the Galilean moons. The Galilean moons, easily visible even with modest magnification, are the four moons of Jupiter discovered by Galileo Galilei in January 1610. They are the largest of the many moons of Jupiter and derive their names from the lovers of Zeus: Io, Europa, Ganymede and Callisto. Ganymede, Europa and Io participate in a 1:2:4 orbital resonance. They are among the most massive objects in the Solar System outside the Sun and the eight planets, with a radius larger than any of the dwarf planets. Ganymede, the largest of these moons, has a diameter greater than that of the planet Mercury. Galileo initially named his discovery the Cosmica Sidera ("Cosimo's stars"), but names that eventually prevailed were chosen by Simon Marius. Marius claimed to have discovered the moons at the same time as Galileo, and gave them their present names in his Mundus Jovialis, published in 1614. The planet is sinking lower in the evening sky, becoming invisible in April. On the eastern side of the sky, at dawn, Venus remains prominent, appearing as a brilliant "morning star," through March and beyond. The glittery, bright "Winter Constellations" of Orion, Taurus, Auriga, Gemini, Canis Major, and Canis Minor are best seen during the early evening hours of late January and early February. The constellation Perseus is in the northern half of the sky, neighbouring the distinctive asterisms that are Cassiopeia, Auriga and Taurus. It was one of the 48 constellations listed by the 2nd century astronomer Ptolemy, and remains one of the 88 modern constellations defined by the International Astronomical Union. It contains the famous variable star Algol (β Per), and is also the location of the radiant of the annual Perseids meteor shower. The brightest star of this constellation is also called Algenib (a name which is used for other stars as well, e. g. γ Peg). Mirfak (Arabic for elbow) is a supergiant of spectral type F5 Ib with an apparent brightness of 1.79m lying at a distance of ca. 590 light-years. Its luminosity is 5,000 times and its diameter is 42 times that of our sun. 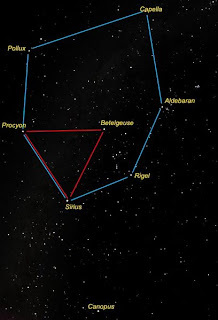 One of the brightest and most interesting stars in Perseus is Algol. The name Algol means "demon star." Ancient skywatchers thought it was cursed because its brightness changes. That's because Algol — which is about 75 light-years from Earth — is the most famous "eclipsing binary" star. Today, astronomers know that Algol is two separate stars. About once every three days, the fainter member of the pair passes in front of the brighter one, and Algol grows fainter. Perseus was a Greek hero most famous for his slaying of Medusa. If anyone looked at Medusa's face they would turn to stone. With the help of Hermes' wings and Athena's shield, Perseus killed Medusa without looking at her. 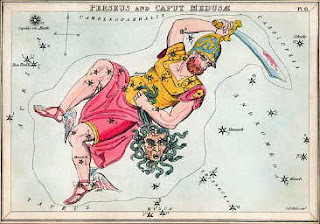 On his way home, Perseus came across the monster, Cetus, getting ready to eat Andromeda. Perseus used Medusa's head to turn Cetus into stone and saved the princess. With a little imagination, you can see the image of a man in the stars. He has a sort of triangular body, with two legs and feet that look like they are curling up towards the head. There are also two arms stretching out, possibly carrying some sort of weapon or the head of Medusa. To the south in the sky, Jupiter is the brightest object, with the bright, unmistakable pattern of Orion rising in the east.